Happy Sunday to everyone, and we in the USA will have Labor Day tomorrow. We’re stuck under a rain belt here in Illinois, so picnics are iffy. “Art in the Park” might still happen before more rain later this afternoon. @northerndawn – great to see another alum of the @coda 2016 school! It will be fun to journey with you again. @beththenew – when to weigh is a constant question. It seems best to just be consistent. I weigh daily and do recognize fluid retention lots of times. I love salt. A character flaw, I suppose, but so far not really troublesome. Have you calculated your TDEE on MyFitnessPal or some other way? I am 70 years, exercise 3x per week, and at 160# mine is 1790. On MFP I do not enter any additional exercise or it tips my TDEE up. I just use the free app on my iPad and phone. The data transfers to both of them – using my Facebook log-on info. Off to play piano with church praise team. Onward and downward. I’m delighted to join this challenge and welcome all the support and inspiration from others. I am new to 5:2 although originally joined in 2016! I AM GOING TO DO THIS …. and looking forward the change in my health and loser clothes. @bellyblast and @northerndawn, welcome back! Looks like many veterans of 5:2 know that they can always return to this forum and do! I’m so grateful that I found it too! Wt. today is 148.2. The lowest I will go for a “range” is 145. After that, the face and arms become crepe paper! Will concentrate this month on toning up. @songbirdme Thanks for the reply. I ran the TDEE calc on this site twice (age 44, 5ft 5in 194.5lbs) Sedentary 1800ish lightly active 2100ish since I think I am between Sedentary/lightly active. I am ADHD so I find it hard to sit still but don’t offically exercise yet. So I decided to split it to about 1900 and played with the settings on MFP (lightly active .5 pounds per week) until it gave me a 1920 goal at my current weight. Do you think that sounds too high for my stats or should I try it for a week or two and see if it works? Right now I am still down 4 pounds for the week but I just started. I would really like to usually lose between 1 to 2 pounds a week but would be ok with .5 pounds a week once the weight loss settles down. Hopefully, today will be the end. On a positive note, whatever I gained on the cruise I lost. :) So I set my goal for Sept to make what I wanted to originally reach. Once that is reached, I’ll set a new goal. Isn’t it amazing how this works?? This fall we are planning a trip to Spain – HOLA!! I’m brushing on what little Spanish I know. 🙂 We love Barcelona but this time will be going to Madrid. We will be touring all over Spain. Which means more walking which means losing weight. HA! It happened in the past maybe again. Anyone here from Spain? If so, any suggestions on what to see? I know there is so much. Hello everyone, 2nd day of September and already we have 3 pages up on the forum. Its going to be a busy month. I am really sorry that my hosting duties are not up to much this weekend, its very full on with visitors and right now I have snuck away from the All Ireland football Final just to check in. I promise to be a better hostess from tomorrow, but right now I want to say hello and welcome to @slj, @northerndawn, and @julesmw. Its so great to see new people arriving and fantastic to have oldies coming back – the wealth of knowledge and experience on this forum is what helps us all get through. @kaywesterman…I am off to Spain myself in another week. I love it. I have travelled quite a bit in Spain and would highly recommend Granada and The Alhambra, Sevilla just for being a fantastic city, the northern coast of Spain with the Picos de Europa is lovely, oh I could go on and on. Enjoy!! I have to go people, but see you all tomorrow. have not had time to post or read all the posts for the past few months. Just wondering if anyone knows how @fatrabbit, @steve toon taxi driver, @ diverdog, @bert, @flourbaby are faring? I would also love to know how some of the other ‘ old crew’ are going. Special message to @northerndawn Here I am! The reason I haven’t stayed is because I’m still struggling with motivation…I do lurk in the background…. I am in, thank you for sharing. This will be an invaluable resource for me as I have just joined the online community and started my new fasting journey! thanks to my dear old friends for the warm welcome back, it’s heartwarming! @dingping I also got through my first FD but it was a struggle, I was so hungry. At 7:00 pm I was feeling so cold, I had a glass of buttermilk, took a book and went to bed. This morning I felt great, first FD done. Do you fast one or two times a week? @michelinme please take enough time to relax, you always seem to have so much work ahead of you. Today went fine, DH is going for it, he only had dinner today, I was hungry and had to eat more, but had small portions. Tomorrow will be the next FD, we have to get up early, the balcony has to be redone. Looking forward to the renovation. Have a nice day/evening everyone! Great Jazz concert last night 🎶 and have to admit to enjoying a few glasses of 🥂before, during interval and after with a some other jazz lovers – lots of discussion about Johannes Berauer’s Hourglass – we all bought the CD!!! A very drizzly morning here but definitely brightening up this afternoon – OH and I enjoyed a late brunch at our favourite cafe – flat white with cheese scone and damson chutney for me 😋 and a lovely salad planned for tea and definitely no 🥂 or 🍷 hoping to make it a very controlled day! A little bit about myself for those new to this WOL – I am a 60 y.o. female, married, with a grown up daughter. Height = 163cm/5ft 4in and I started this WOL on my own in January 2016 – joined the challenges in November 2016 as I had plateaued for around 3 months and reached maintenance in early December 2016 and have been in maintenance 53-55kg/116.8-121.2lbs since then! @wrxgirl – Ouch! safe recovery from that nasty injury – you can still lose weight whilst sedentary – adjust your daily TDEE accordingly and eat 1/4 of the new level on your FD – the hardest part is not to be tempted to snack because you can’t stay your usual active self – Think of us all here as your conscience when you reach for that comfort food!! @anna6 – you can lose those pesky lbs gained – maintenance needs you to remain vigilant but you know you’ve done it before and can do it again! @emma1202 @ccco @steffieagle @dingping @bellyblast @rara0292 – Welcome back – so lovely to hear from you again – remember that Together We Are Stronger! @northerndawn – Welcome back – I remember you from the December 2016 challenge – it was the month when I reached maintenance and I have been here since still maintaining! @beththenew – I found eating to the TDEE for the weight I wanted to be and not for the weight I was worked well for me and it helped to train my mind to eating to what I should once I reached maintenance! @lilymartin – both @bert, @flourbaby pop into the challenges regularly – the others we have not heard for on here for quiet a while but I know that @fatrabbit has her own thread and is still in maintenance! *Don’t overestimate your exercise level! Not much time to post, waiting for my friend to arrive any minute …. So glad I concentrated on getting ready for today and resting as it always makes for a much happier day. Yoga first thing while listening to a meditation made for a balanced beginning, while simply knowing that I’m ready and have timings planned makes for a calm start to the day. It’s been another truly carbtastic weekend! Yesterday i had bring-and-share lunch of bread, salad, eggs & cheese; came home and had bread & salad for supper. Today I met lovely friend for our quarterly catch up lunch: splitting a small sourdough loaf followed by a superfood salad. Shame about the chocolate orange brownie I had afterwards,before coming home to eat more bread. What is wrong with me?! NB MUST slice & freeze this loaf before it disappears. Unsurprisingly after this two-day effort my carbtastic tum has shot out to new heights and, combined with my loose arty potcketed linen tunic, caused someone on the bus to ask me when i was due 🙁 🙁 🙁 Clearly Something Has To Change! I’ve got a few things off my long list, and tomorrow’s meeting has been cancelled – yay! I’ve now got 2 full days to get my writing done – still going to take focused effort but slightly less impossible. WFD tomorrow so hoping that will keep me focused and energised & start reversing my abdominal inflation. @rainbowsmile sorry to hear about the bruising boot, hope you find some suitable soft padding to make it sustainable. 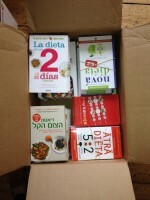 Wonderful to hear you are adapting the 30day shred – go gently, and good luck! This is the start of my fourth week back on the 5:2 diet. I’ve been reading a lot of the posts on the August Challenge, because I didn’t know it was possible to join the thread in mid-month. What terrific support you all give each other! I have 11 lb (5 kg) to lose to get my BMI down to 24.9, so that is my current goal. Here, out in the country, it’s a warm (92 F = 33 C), sunny afternoon with just a light breeze, so that the 7 foot tall corn on the other side of my backyard fence is waving to everyone! I’ve posted today and it seems that it disappeared. NorthernDawn welcome back. You’ll soon lose these 25 lbs you want to lose with this wol. You need to plan your fd and cd. At thanks for your encouragement. I need it. I want to lose these for kilos to reach my target of 64 kilos. I’m currently 68 kilos. My BMI of 25 will be at 66.5 kilos. Tomorrow is a fast day for me. @snowflake56 my Lille trip is this coming Thursday-Saturday. Will look up the flea market although it sounds a bit overwhelming. We only have one full day so need to choose wisely! If you have any recommendations id be very grateful to hear them. @sarahbob your message made me laugh! Hope you managed 30DS today? I very nearly didn’t. Had a very lovely lazy feast day and almost used that as an excuse not to do it. But then thought of you and felt I’d better fit it in between unpacking from hols, laundry and epic face stuffing. Why does level 1 feel more difficult than level 3?! Was glad I’d done it…especially when husband and son came home from supermarket trip with chocolate millionaire Gu pots! This was after a day spent picking on yummy bread, cheese, bread, pate, more bread, olives and pickles, and the like. Glad to report it’s all gone from the fridge now! Supper was a meaty spaghetti bolognese although by that point I’d eaten so much bread that I skipped the spaghetti. Had broccoli and carrots on the side instead. @at I love your post, so much great advice and your own story is very motivating. Congrats on losing that weight and achieving better health. Thoroughly enjoyed feasting today and it’s so nice to now be able to do it without guilt, knowing that I can balance things out with FDs and staying within TDEE the rest of the time. As this WOE becomes my WOE, I’m easing into letting go of the guilt related to eating habits which I felt with other diets. It feels good, and healthy. I weighed in this morning almost a kg below Friday. Water weight perhaps? Whatever it was, I’ll take it! Back to FD tomorrow and am planning b2b2b ahead of Lille trip on Thursday. Looking forward to my 1st proper FD in a long time. September is such a beautiful month – Spring time in Australia, and stirs my inner motivation to get out there and be the best I can! I get great joy and encouragement reading all your posts and feel like its a virtual family support base with us all caring for each other, and helping each other, towards success in this WOL! Thank you all. I’d like to start the FD pocket list for today: have a fun day everyone! Just going to add myself to pocket list for Day three. First day back in the office might not have a chance to check in! Busy with the holiday but wanted to check in quickly! I had a great FD yesterday and a NFD today. I need to eat more before a FD, so tomorrow will be another FD. Can’t believe we are already coming up on Day 3 of September! Good night, everyone! Water fasting … about 12 hours in, 24 to go. Mostly working. Joining the pocket list FDers. I am looking forward to a decent FD as it has been some days since I did a ‘ good’ one. I can often manage all day and am fine – not wanting/ thinking about food. Then I get home and about 7 pm start to get the hunger pang munchies. Back in 2016 I had the steely determination and motivation to keep my mouth shut to food, drank plenty of water and managed to keep those pesky calories away. It is actually heartening to read of others’ struggles and know that this WOL presents it’s challenges for others too! Makes me feel a whole lot better though not necessarily thinner or fitter…..! Anyway welcome back to all the oldies and welcome to all the newbies. ( will be happy with a 2 kg loss this month). @at thanks for the catch up on previous Challengers. I will try to look up @fatrabbit‘s thread. @michelinme I too adore carbs – even when I try to cut down on them they seem to leap out at me in unexpected ways and places, like the fresh Turkish loaf my DH bought on Saturday before lunch which we demolished by lunchtime! And with DD visiting from Sydney for a few days toasted sandwiches are making a regular appearance …..
@dykask, I am still amazed at your ability to fast so frequently with just WF. I obviously could do with some of your determination. This week is Jean Hailes’ Women’s Health week so I plan to be kind to myself and actually DO some of the healthy things suggested rather than just read about them. I am also going back to MFP to plug in the numbers. I do so dislike crunching calorie numbers but it is what helped me get my FDs and TDEE under control when I first started this WOL so I plan to do that for this month. A beautiful sunny spring morning is calling along with our little birds – their chorus is amazing . Off to make sandwiches and minestrone soup and cake for the 5 workers who have turned up for sheep work today. @lilymartin – I really enjoy eating a lot. I also find it difficult to fast if I eat during a FD. So by water fasting I get easier fasts and I don’t have to worry about how much I eat on NFDs. I typically eat around 3000 calories on a NFD, sometimes only 2500 but sometimes more. The water fasting also has focused my tastes to healthier foods. For example I often prefer nuts to a sugary treat. I often find myself choosing salads over a meat dish, etc. With fasting I’m eating a far better diet than what I did with calorie restriction. The best thing is it happens naturally, I don’t have to force it. First, I’d like to thank @daffodil2010 for hosting this challenge and warmly welcoming me back to the forum. There are so many people signing up that it seems you will be quite busy. I really don’t know how to add myself to the spreadsheet so I would be indebted to you if you would do it for me, please. I promise I will learn going forward. Thank you to all of the “Oldies” and newer members that have extended a welcome back to me. It means a lot: @songbirdme, @anna6, @metatauta, and @at. You have all done so well! Do you think being part of this forum and the support it gives is part of your success? I remember you, also, @at, and I have often thought of your mantra over the past year and half. I’d say I’m a perfect example of it: If I quit now, I’d wish I was now where I was then, to paraphrase. Yes. So true. Not desperate, though, because I know 5:2 works and I can get back to where I want to be. But definitely so much time wasted from then to now, for me. @at You are an inspiration going forward. Good for you and congratulations for sticking with the plan all this time. I admire you! @rainbowsmile, you were so entertaining as a host last month! Totally enjoyed reading some of your posts. Please, take care of yourself and do not hurry your healing. I know from experience that it might set you back weeks if you try to. Not worth it. Be patient. @wrxgirl: Yikes! That sounds like a terrible day. No fun to be in those boots, but it is for the best and soft tissues take longer to heal than you would think. Be kind to yourself and also, as with Rainbow, be patient and let it heal well. I have a yellow legal pad in from of me and I’m trying to write down a bit about each one of you posting on the forum, in order to get to know you all, and to be able to respond in a personal way to all of you lovely people. Positive thoughts to everyone tomorrow, fasting, maintaining, and controlling TDEE. @beedoo I looked up the fleamarket, it was on September 1st and 2nd. I’m sorry, I can’t tell you anything about Lille, just drove though it once. @lilymartin my problem in the last two month were portion control, carbs and Dutch food, hard to resist all of those. Toasted sandwiches with ham and cheese? So tempting! @northerndawn I don’t know how to put anyone on the spreadsheet either, this is, apart from the language thing, the main reason not to lead a monthly challenge. Hi everyone! I’m a couple of days late checking in for the September challenge, but I’m definitely here! I didn’t quite hit my August goal, the scales seem to bounce around a bit, and being 3k off goal has meant even the small losses are huge wins. I’m also tracking body fat/muscle mass every few weeks so i don’t get discouraged when the scales dont move – and over the last three months the scales have hardly budged, but i’ve gone from 22% – 18.5% BF, which is the important thing i guess! Day 1 started off strong with a 12km run (training for a half marathon in 6 weeks – feeling incredibly unprepared but optimistic, it has just crept up on me! ), though Saturday included plenty of wine, which made my NFD yesterday a bit of a feast. FD today, today, and feeling pretty good. Will catch up on all the post later this evening. And thanks for hosting @daffodil2010 – August was my first challenge and i just love how supportive and welcoming everyone was, so looking forward to this months challenge! Happy Monday everyone…….or is it? A weekend of guests and activities and food and drink and this gal has put up the same few pounds that I always seem to put every weekend 😆 So it’s an FD today and it will be an LFD….hopefully. Herbal teas and water all ready to bring into work. In another week I am off on a 3 week holiday so I must focus this week. It also gives to show the wonderful collaboration we have on these monthly challenges, honestly, the forum runs itself with everyone commenting and providing advice…..and most importantly….providing daily support. Great to have you all on board. I am a 51 year old female, slim and petite at 5’2″ and love that I can now call myself slim. Since stopping smoking in 2002 the weight gradually started to come on. I have been to Weight watchers countless times, I was successful with the Dukan Diet and lost 50lbs, but three years later I had put back on 35lbs. I started this WOL in July 2017 and have lost those 35lbs. I have about 5 lbs to get to my lower acceptable weight range, so will continue on with 5:2 or sometimes 4:3 until I get there. I believe the support and encouragement from this forum is truly world class. I went through a traumatic work situation at the end of July and the supporting community of this forum really helped turn me around. So, I will pop back in tonight and post comments but in the meantime have a great Monday. @beedoo I REALLY didn’t want to do 30DS at 9:30 last night after being terrorised by the baby all day but I did it. Yaaaay!!! 😁 Level 1 is horrible. It’s those damn anterior raises, I hate them, grrr! Good luck to today’s fasters and I hope everyone has a great Monday. Spent the weekend binge watching YouTube videos on healing and exercise. I have slept a lot. There was something really weird going on in my bath, I accidentally left the water in the bath and the bath was coated with brown gunk. I assume that is something in the pipes either that or I am going rusty. I am looking for a book on healing, open to suggestions. I desperately want to get rid of these excess pounds to ease the load on my ankles. I think I must have also damaged my wrist when I fell as it aches but there is no bruising or inflammation, just an ache in the back of my hand. So I will see how that goes. @daffodil2010 I have my suspicions who that Angel might be! I want to describe myself as slim too, you have worked so hard to get to within 5lbs of your goal. I remember you joining and have steadily got there whilst I have struggled to lose a measly 1lb per month. But 1lb a month it is and the tortoise club membership is on trial. @gretta yes replacing fat with muscle is a great achievement. Congratulations on that achievement. @lilymartin I love MFP and I have a fitbit, but my lack of ability to move means my diet has to be precise at the moment. Like @dykask I normally find WFD easy as I don’t have to think. I do 24 WFD starting at 7 pm in the evening that way I can eat each day! @diana123 I am including you and your family in my daily votive. Wrxgirl I also included you today, i hope that’s ok.
Back to work today, but it will be from home. I have heeded all the warnings and am resting as much as I can. Morning all – a quick log in from me, working on a very tight deadline this week and miles behind where I’d like to be, thanks to the epic kitchen refit (which is now FINISHED!!! – All bar a new threshold for the doorway but I can certainly live with it like this!). Today’s my first proper FD in over a week, though it feels like such a long time ago. I’m sticking to fluids through the day and will be making a little curry this evening with the leftover chicken from our roast dinner yesterday. Feeling very full / bloated from the EFS – looking forward to giving my system a little time to relax! @at thanks for the offer of support!! It’s amazing how hungry sitting and reading academic journals can make you! Water will see me through, no doubt. And if I get really hungry, there’s an egg in the fridge or an apple in the bowl for a FD snack. Glad you enjoyed your jazz concert – me & my DH are big jazz fans too. We’ve not made it to a concert for a while, but hoping to see Kurt Eling soon. In need of some moral support today, as I battle to lose those final pesky 3lb to reach my maintenance goal, hopefully this month. It is definitely getting harder nowadays, which means I really need to review my eating patterns on NFDs to ensure I’m not exceeding my TDEE for my goal weight. Even so, I’m happy with the nice, slow, steady rate of loss (1-2lb per month in recent months). Just need to keep on sticking with the programme! Weight today 3lbs up on Friday, not quite the perfect start to Sept’s Challenge! Aiming for WFD day today, break tomorrow lunchtime or supper time – perhaps even go for a FD tomorrow and get good start to week before going away for training day where it’ll be more difficult to control what I eat. Feeling bright and motivated this morning, day getting off to slow start but just about ready to get going with an hour’s gentle yoga & meditation before getting going with writing. Need to get two short reports drafted and sent off for comments today, and two talks mapped out and first drafts written – FOCUS! Will try and break it up by taking things outside to scribble on, and short breaks eg to write & post card to sick friend – a trip to post box can sometimes be just right length to refresh my head. Aiming to finish by mid-evening, wind down before very early night. Today I have the opportunity to shape my week, taking good care of Future Me. Doing well this FD. The D-Ribose I took this morning was worth calories spent! I was able to breeze through a number of very physically active hours early in the day without feeling usual fatigue when I do so. @wrxgirl I hope you are doing ok.
A little about myself – I’m 61 and live in northeastern Spain with my husband. At my heaviest I weighed 114kg. I got down to 100kg and had a gastric bypass. I have lost 32kg and have kept it off for 7 years. Really, really want to lose anoth 4-5kg so that for the first time in my life I will be at a ‘normal’ weight. I used to do a lot of walking/hiking, but I was very ill last year with thromboses in my chest and this has left my chest pretty weak. Would really like to do the Couch to 5k challenge, but first of all I’m upping my walking to build strength and stamina. Sorry, had a question I forgot to put in my post – what is a pocket list please? So I’ve been bouncing around at my target weight for several months now. I have found that even for maintenance I need to do 2 X FDs per week, which I really enjoy. However, to say that we ate heartily at lunch and dinner during our August holidays would be an understatement! When I add in the delicious pastries we had for breakfast and the copious amounts of wine we had every night, then I guess it should come as no surprise that I have gained FIVE POUNDS!!! So I need to lose those five pounds again during September. I’m going to aim to do 3 X FDs per week (Monday, Wednesday, Friday). Looking forward to sharing in everyone’s ups and downs and good luck to all! New here and would love to join the September challenge. Day 3: FD. Hoping to start with a positive day! Another busy day yesterday doing long put off jobs with OH which led us both being frustrated with each other! Eating was irratic but not excessive. Aiming to get back to basic this month and get this WOL under my belt again. That spiral into negativity can happen hard and fast, it’s a battle to not let it swallow one up. I surrendered to it recently and stopped posting and weighing myself as I felt such a failure. Thankfully I’ve found my way back and accept one day at a time and hope staying accountable here plus the unconditional friendship and support I receive will drag me through those darker days. Fasting gives me control in mind and body, I feel balanced – @michelinme you’re right intrinsically linked to self care and for me self worth. I must not turn my back on those that want to help me succeed and at times believe in me more than I believe in myself. Thanks everyone for being here. On a lighter note good luck FD’ers, @snowflake56 you’re amongst a crowd today that will carry you through, hope it’s not as tough as Saturday’s. Hello from a drizzly Cumbria today! Looks like I wasn’t the only one that had an EFS weekend – too much wine and good food so pressing my RESET button with a minimal calorie FD trying to keep to water and cups of tea with skimmed milk only so will definitely be joining the pocket list for support!!!! @michelinme – 🤗let us support each other after our rather disastrous weekend – Hope that you have a productive day with your writing – you can do this! @anna6 – you are very welcomed – looks like we are on a FD today together so we can do this! @beedoo – Thank you – hope that you enjoy your weekend trip to Lille – Highlights include its enchanting old town with magnificent French and Flemish architecture, art museums, stylish shopping, very tasty food and a surprisingly good nightlife scene – did you know that in 2020, Lille will become the World Design Capital (the first French city to do so), with design agencies and other creative enterprises opening their doors to the public, and exhibitions and festivities throughout the year. @lilymartin – I use MFP too – usually very helpful to keep me accountable or to make me realise how much I can eat like I did this weekend!!!!!!!!! @snowflake56 – I think you would make a wonderful hostess and there are many of us who could help you with the spreadsheet – lots of personal benefits from hosting to be gained! @gretta – great job on that body fat drop and planning a 1/2 marathon in 6 weeks 🏃‍♀️ impressive! @daffodil2010 – I’m with you in “support and encouragement from this forum is truly world class.” I truly believe it’s what has kept me in maintenance! @sarahbob – I’m in awe of you doing the 30DS at 9:30 last night – now that is commitment! No time to read post today just a moment to pop on for accountability and to add myself to the pocket list. I will print in out and stick it in my bra for support today. So… today’s FD went really really well. Under 100 calories until 7.30 pm when I arrived home from work to …. lasagne and salad made specially by my DD. How could I refuse the lasagne after all her work??!! Anyway, I may just have scraped in under TDEE ( though doubtful ) BUT I did drink a lot of water, peppermint tea instead of my usual 3 or 4 flat white coffees which I love. NO chocolate or wine or dessert was consumed so at this stage that is a win!! @rainbowsmile and @at, I have used MFP since joining in November 2016. I used it for some months to get a handle on TDEE as I often found I had to be much more mindful on NFDs than on the FDs. I prefer not to count calories but the past several months have shown me that you can fool yourself a lot of the time! Will try for another FD tomorrow despite having to cook biscuits and cake for morning tea ( required) and despite going out to dinner with friends at a restaurant that does not serve a simple salad. It does feel good to be back in the groove. @dingping, I know how it feels to fall back into that negativity. We will all help you with this WOL. @shinything, yes I wonder what it is that makes us self-sabotage? It would be helpful to know but in the meantime, I’m with you – and we can do this together. @fatfingers, plenty of moral support here to help you make that last hurdle. @skinnyminny57, welcome and congratulations on your earlier weight loss successes. I had your exact ‘ handle’ once on another completely different site!